The soon-to-be-renamed Manny M. Aragon Library at Lowell Elementary in Albuquerque. 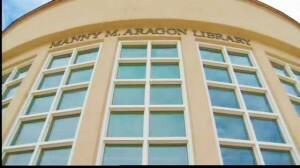 It seemed like a good idea to name the library at Albuquerque’s Lowell Elementary School after Manny Aragon. The state Senate leader helped secure funds for the building, and he grew up not far from the school. That was in 2004. It probably seemed less so in 2008, when Aragon pleaded guilty to corruption charges for his role in a scheme to defraud the State of over $4 Million, putting $600,000 in his own pocket. He was sentenced to 67 months in federal prison and had to pay over $1 million in fines and restitution, but the Manny M. Aragon Library remained. This week, the Albuquerque Public Schools Board of Education voted to finally change the name.